A two-pad launch complex at Site 90 was built during 1962-1963. As other facilities on the western "flank" of the NIIP-5 test range, it was designed for testing of rockets developed by Vladimir Chelomei's OKB-52 design bureau, in this case, the 8K81 (UR-200) ICBM. The missile flew nine missions from Site 90 in 1963 and 1964, before its development was canceled. By 1967, two launch pads at Site 90 were refurbished for the Tsyklon-2 launcher, delivering anti-satellite weapons and nuclear-powered reconnaissance satellites for the Soviet navy. The first launch of the Tsyklon-2 rocket from a highly automated launch complex, designated 11P869E, took place on October 27, 1967. The launch complex 11P869E at Site 90 remained operational at the beginning of the 21st century. 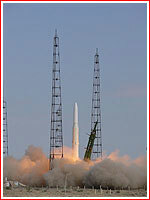 In September 1998, the facility was transferred from the military to the KBTM design bureau, which developed launch complex for the Tsyklon-2. Launch Pad No. 19 (PU-19), "left" pad: Built during 1962-1963 for the 8K81 (UR-200). It hosted seven launches of the UR-200 ICBM from Nov. 05, 1963 until Sept. 29, 1964. Between Dec. 27, 1967 and January 25, 1969, a total of five 11K67 (Tsyklon-2) rockets were launched from PU-19. The site was under repairs during 1989-1992, which is apparently incomplete. Launch Pad No. 20 (PU-19), "right" pad: Two UR-200 rockets flew from Pad 20 on Oct. 2, 1964 and Oct. 20, 1964. After refurbishment, three 11K67 rockets flew from the site between April 24, 1968 until Nov. 1, 1968. From Dec. 23, 1969, launches of the 11K69 version of the Tsyklon-2 rocket started at the site and continued until the beginning of the 21 century. 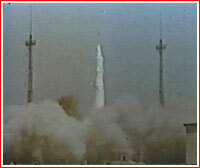 More than 100 launches took place from the site. During 1968-1988, when the USSR was launching the US-A nuclear-powered radar satellite, their reactors were processed at Site-94A, located away from the rest of the processing complex on the extreme western edge of Baikonur. The facility was later transferred under control of OKB Vympel and apparently remained in working order during 1990s. A large residential area, known as Proton city supports all operations on the "left" flank of Baikonur, including Tsuklon-2 launches.